I know some of you fought snow yesterday, and I'm sorry. I know some of you wore short sleeves with no jacket for the first time last week, and I'm surprised. I know some of you are still enjoying spring blossoms, including the first few buds of lilacs, and I'm jealous. 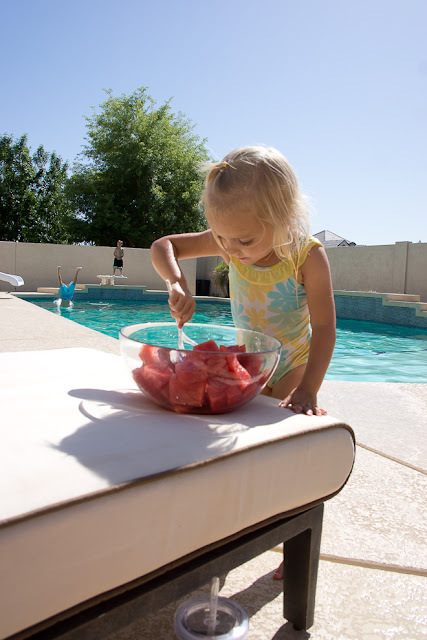 A big bowl of watermelon out by the pool after school. Yeah, it's already over 100 here. Ben was born on April 24th, which was the first 100-degree day of 1996, so I use that day as a gauge. If we haven't hit 100 by 4/24, we are having a cool spring. Yeah, 100 is still spring. Different climates, different beauties. Love watching spring awaken all the green this time of year. And there is nothing like spring flowers. That watermelon looks fabulous, I am jealous--I have yet to bring home a juicy, delicious melon. I told myself it was too early, but now I think I just need better picking skills! P.S. Micah looks awesome! Did he show you his square knot? It feels so spring like! I love this weather! Oh my! Loved catching up over here. The pine wood derby video brings back memories! 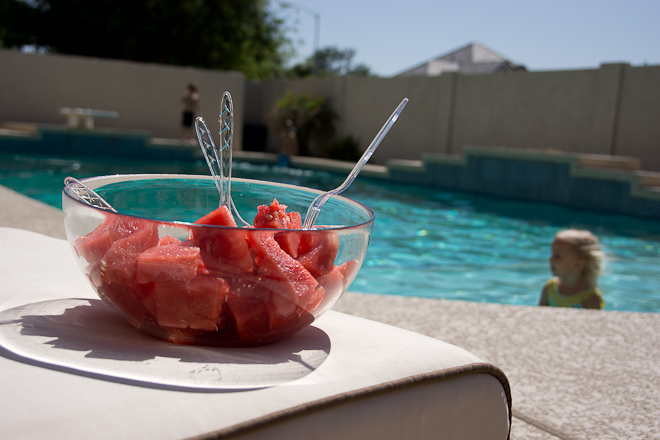 The pool and the watermelon make me happy that summer really is coming! That baby girl is sooo big and does that ticker really say 13 days? Yay! A couple of weeks ago I would have been WAY jealous coming over here and seeing your pool and yummy watermelon. But, lucky for you...we had beautiful day today too and so all is good! It's amazing how different my attitude is when spring gets here and our temps are warmer. Even though I don't blog anymore, I still like to follow what you are doing. Can't believe Tucker will be home so soon, you must be soooo excited. I love that y'all have 100 degree weather. We just got 6 inches of snow on May 1st. Colorado's weather is Bi-polar. Looks so great and yet I don't think I could take that kind of heat anymore. Wow, 100 degree spring. That's pretty hot in my book, though I guess California has had those types of days too. I'm glad we have actual spring weather in Tokyo right now though its been fluctuating from really cold to really hot the past few weeks too.